Salem Hills Farm was established in 2001 by Julius Price to turn a hobby and passion into a job that he’d love. Julius’ 70+ acre farm which was purchased in 2001, a few years after graduating from the Citadel, is the farm used today to raise his cattle. 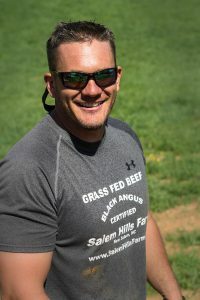 In 2011, Salem Hills Farm started selling their 100% Grass Fed Beef at the King’s Drive Farmers’ Market in Charlotte, NC. This historic market has been owned and operated by the Simpson Family since 1941. Salem Hills has continued to grow by adding several local restaurants and offering home delivery during the off season.